As Kalonzo Musyoka through action and inaction threatens to revert to his true self, it is merging that Raila Odinga has on several occasions called and pleaded with him to stand firm and give a blind eye to the juicy carrots dangling on the other side. Fear within Cord has been that kalonzo has gone quiet and is rarely in touch with his fellow principals in the opposition Raila and Moses Wetangula. Further, it is said Kalonzo is slowly easing out of the referendum push up[on discovering, firstly, that it is aimed at rebranding Raila for a last bid for the presidency in 2017 and secondly, after realizing that the push was having a weak traction in his Ukambani backyard. 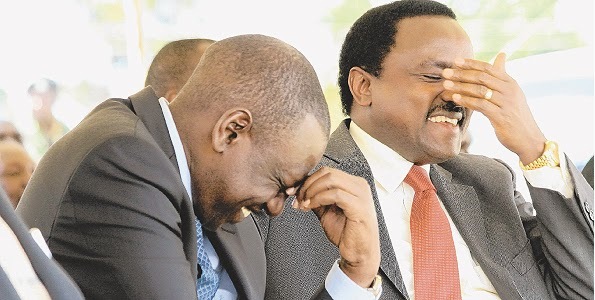 Word has it that when Raila stated he will run for presidency again, it landed like a heavy steel blow on Kalonzo’s heart and he henceforth started working on a plan B. It is worth noting that the Wiper party chairman, the softspoken Kitui governor David Musila, a former long serving provincial administrator, has been hinting signals of willing to work with Jubilee. Musila was at hand to warmly welcome President Uhuru Kenyatta when he visited Kitui. The people said to have influenced Kalonzo to back referendum was Machakos governor Johnson Muthama and the embattled Makueni counterpart Kivutha Kibwana. 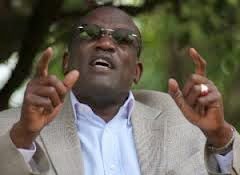 It is the same Muthama who took a reluctant Kalonzo to Raila in the last elections and eventually now in opposition wilderness something that Kambas are vowing never to forgive Muthama for. Kambas were last week wondering why Muthama was now praying in rallies that Uhuru and William Ruto are jailed when he accompanied Uhuru to the Hague during Uhuru’s first visit there and even paid the airfare for some MPs from Central Kenya a fete he was so proud of he kept on showing visitors to his Gigiri office the airtickets and hotel receipts. Concern within Cord is that if Kalonzo rebels and moves out and going with happenings in Coast politics and poorly attended referendum rallies, all will be lost for the opposition. Kalonzo has been extraordinarily silent in recent weeks, disappearing to China and South Africa on some say mundane meetings with chambers of commerce. As your favourite Weekly Citizen revealed a fortnight ago, the watermelon man of Kenya politics has in fact been negotiating a defection deal with the ruling Jubilee. Kalonzo’s strategy is to deliver his Eastern ethnic vote bloc to Jubilee at the worst possible time for Raila and Cord. Keen observers of Ukambani politics will aver that the region’s critics of Kalonzo have of late kept mum with what is said to be instructions from above. Charity Ngilu who holds a cabinet slot is not allowed to participate in active politics. Unconfirmed reports have it that Kalonzo’s party together with Eugene Wamalwa of New Ford Kenya are being considered to the formation of a new political outfit that will see TNA and URP fold to form a single party ahead of 2017 to propel Uhuru to a second term in power. The deal will see Kalonzo rejoin government in some high capacity that is still being thrashed out. Others however say what is slowing the deal is a section in Jubilee that believes the so-called shuttle diplomacy Kalonzo engaged in to supposedly save Uhuru and Ruto and which Kalonzo is using to endear himself to the two was used by Kalonzo to actually nail them. They say during his meetings with the officials of the countries he visited, Kalonzo would leave the Kenyan team outside and enter alone and suspect Kalonzo probably was not saying what he had been sent by his boss Mwai Kibaki to say. They cite the fact that the mission failed to back their suspicions. By disappearing from Kenya’s political scene for weeks on end and removing himself from the referendum debate at a critical time, and not even keeping in touch via social media or significant press statements, the way the former PM does, Kalonzo has been keeping many guessing. Kalonzo’s extensive offshoring travels are managed by top secret Jubilee teams of wheelerdealers out to deliver him in government to cut business deals. For a long time, brokers have managed to deliver opposition forces on government side. One example is during the Moi regime when Raila moved to Kanu courtesy of then powerful nominated MP Mark Too. In 2013, Muthama delivered Kalonzo to Raila. In then current Jubilee government, it is said business tycoons Jimmy Wanjigi and David Langat were instrumental in having Ruto agree to be Uhuru’s running mate. The question is who will deliver Kalonzo to Uhuru bearing in mind he was a key player in G-7 group that had Uhuru, Ruto ,Wamalwa and Chirau Mwakwere. Initially, Kalonzo banked on the group to be president but after being short-changed and given leader of majority in parliament with 33pc stake in government, he felt betrayed. If Kalonzo falls to Jubilee tricks, he will deal Raila the political body blow of his life so far - and cost him the 2017 presidential race even before it starts. 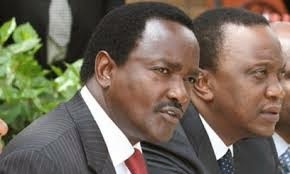 While Kalonzo was away, strange things happened in Ukambani, including the fall of two professors. The first don to come tumbling down was Makau Mutua of New York, one of Kalonzo’s closest confidantes and boosters and one of the operatives who took him into Cord to become Raila’s running mate in 2013. Mutua was caught out on a routine lie to a US court of law and he was required to resign from his prestigious position of Buffalo University Law Dean. 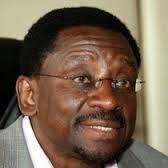 Two things remain to be seen; whether Makau can continue to be a Raila backer even as a proven international liar certified in the USA and whether the Standard Media Group can continue much longer with his weekly opinion column dedicated to Uhuru bashing 52 times a year. The next Mkamba don to fall was Kivutha Kibwana, the governor of Makueni, who was impeached by his MCAs in an elaborate plot involving Makueni senator Mutula Kilonzo Jnr, who cannot have been acting without Kalonzo’s nod from the offshore. Kibwana, who was a presidential adviser alongside Raphael Tuju at OP during Kibaki’s second and final term, was critically important to the Okoa Kenya referendum push and was one of the few strategists who gave it teeth. 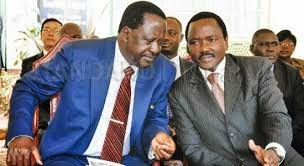 The fact that two of the most highly educated and strategically placed Ukambani elite members, both of whom were totally committed to Cord and Raila’s leadership have come a cropper in the run-up to the Okoa Kenya referendum drive is the clearest indication Kalonzo has to go back to the drawing board. As this is happening, Wetang’ula must be scratching his head. Speaking in Kitale town, the Senate Minority Leader said he wants Wamalwa appointed Attorney-General. Why does Wetang’ula want Uhuru to appoint a Mluhya to a position until recently held for over 20 years by another Westerner, Amos Wako? Other observers are wondering why Wetang’ula is giving such good advice to Jubilee while he is still a Cord principal. 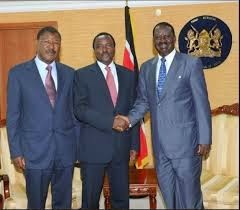 If Kalonzo jumps ship as anticipated and Raila finds himself alone inside Cord with Wetang’ula, it is a foregone conclusion that the latter will want to launch his inaugural presidential contest run in 2017. Jubilee last week paid back Raila in full for his ‘Baba While You Were Away’ homecoming stunts on May 31 2014, that were quickly followed by the stressful National Dialogue, Saba Saba Storm and now Referendum push. UhuRuto pulled out the biggest rabbit of all from the biggest hat – the 48-hour transfer of presidential power, the attendance at The Hague in person and the triumphant huge, homecoming that did not interrupt or threaten anyone or involve gathering in a stadium. The ICC’s timing of summoning Uhuru to coincide with the immediate aftermath of his two highly successful visits to the USA in consecutive months, was clearly intended to take the sails out of his increasingly high profile in both continental African affairs and the global stage of the US and UN. Three strategies fell flat on their faces with Uhuru’s creative response to the rude ICC summonses – the first one was the international campaign set in motion by Ambassador Johnnie Carson of America when he was in his final months at the State Department when he warned Kenyan voters that “choices have consequences” just before the March 4 2013 presidential poll. The second strategy was the ICC’s arrogance. Having summoned Uhuru to appear in person, the court seemed not to know what to do with him. They finally had a whole incumbent African president in the courtroom, something which the ICC has wanted to do since it was set up. He had taken the precaution of transferring his powers to another ICC accused and made it clear that he was there in his personal capacity. The third strategy, though seemingly unrelated on the surface, is the opposition Cord’s referendum push that was cleverly timed to coincide with the midway point, next year, in the Jubilee administration’s first term in office. All five of the top Cord leaders were out of the country when Uhuru made his triumphal return home. Raila had left for the USA and Mozambique, where he will spend weeks away from Kenya; co-principal Kalonzo has been missing in action for more than a month, reportedly in China and South Africa; co-principal Moses Wetang’ula had been in Cameroon and at his first rally back on Thursday called for Wamalwa to be made the Attorney General; and ODM secretary general Anyang’ Nyong’o, father of Hollywood star Lupita Nyong’o, was in California. It is said they got wind Uhuru will hand over power to Ruto and decided never to be under Ruto presidency for 48 hours. For now, political analysts say the Okoa Kenya referendum push which Cord is trying to push has run completely out of steam for now after failing to connect meaningfully with the Council of Governors’ Pesa Mashinani campaign. Even the much-hyped 5 million signatures campaign is no longer in the headlines and its results have been pushed to four weeks from now. Curiously, few neighbourhoods in Kenya, even in the Cord/ODM strongholds, report sighting any signature events and there is very rare coverage of the signings by both the print and broadcast media. What is going on, or, rather, not going on? In fact, the referendum signatures have come to haunt Cord strongholds with politicians in county assembly, senate, parliament and governors at loggerheads with those they defeated or those eyeing their seats. They are all using signature collections to lay ground come 2017 resulting into hostility in the Cord house. The Cord leadership has finally realised that devolution is a more complicated affair. The key to political power and influence in Kenya is money and the Cord principals are disadvantaged. For now, Raila and Kalonzo are feeling the pinch of not having access to bottomless state funds. It is on these grounds Uhuru on return from The Hague, was desperately looking for backers in Western capitals. And so it was that Uhuru and his inner core pulled off a very fast one when they decided they would not give their adversaries at The Hague and among some of the world powers who finance the Court, but do not believe in it, the pleasure of suddenly not cooperating with the ICC. They came up with the strategy of the president transferring his powers to deputy president Ruto for 48 hours and turning up at The Hague as private citizen. This was a masterstroke that left mouths agape and minds in speculative overdrive. African presidents take presidential power to be indivisible, some even when they are in ICUs with terminal ailments. Analysts say Uhuru has played his ICC cards masterfully. The Western capitals can barely believe what he has shown them in less than two years as president. First, despite and in spite of the ICC case, he has endeared himself first to the African Union, where he has led a pan-African resurgence, and then to the US and the UN. President Barack Obama was the first person outside Uhuru’s innermost circles who was informed that the Kenyan leader would indeed honour his summons to The Hague by temporarily transferring power. This as the former prime minister had one of the most disappointing weeks of his 69-year-long life thus far last week. Not only did the man he opposes fiercely tackle a potentially dangerous ICC summonses head-on, but he also passed presidential authority to Ruto, a man Raila does not want to hear mentioned. Uhuru played his Hague cards so expertly that he kept saturation media attention on himself throughout the week, relegating Raila to the far inside pages of newspapers and nowhere on broadcast media. While Uhuru was away at The Hague, the Cord and ODM supremo returned to the USA for another lecture tour after which he will embark on an election observer mission to Mozambique. Raila told an attentive audience at the prestigious Yale University in the US that it is up to the ICC’s judges to decide whether the Kenyan government is cooperating in the investigation. He said prosecutor Fatou Bensouda maintained that the Kenyan government had not cooperated, while Attorney-General Githu Muigai asserted that the government had provided all the information asked for. As things stand, even if the court clears Uhuru and his deputy is fixed, the political events in the country is bound to change.